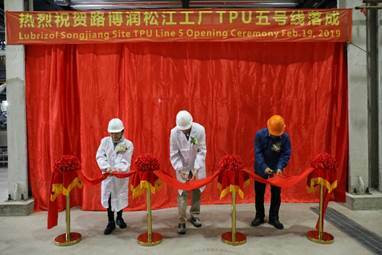 CLEVELAND, March 19, 2019 - The Lubrizol Corporation announces another new TPU line in its Songjiang (Shanghai) China plant going into production this month, the second expansion in a year aimed at continuous growth in Asia. A ribbon-cutting ceremony was held in February as part of the Lantern Festival which symbolizes unity and perfection in China. 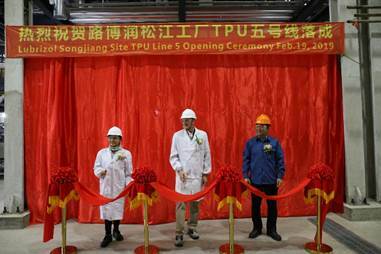 This momentous expansion of the Songjiang plant follows the launch last year of a new compounding line. Both expansions are aimed at supporting the company's Engineered Polymers business. Lubrizol has been adding capacity to its global TPU manufacturing footprint in every major region of the world to support the fast-growing demand for specialty elastomers. The new line in China will increase capacity for specialty applications by nearly a third. "We value the Asian market as a critical region where we can drive future success for Lubrizol," states Ms. Jane Cai, regional business director, Lubrizol Engineered Polymers. She continues, "We have seen strong opportunities and broad growth in Asia and Greater China in recent years, and our continued investment will enable further customization of materials to the specific needs of customers and markets. At Lubrizol, we are focused on improving lives - from consumer lifestyles to the service life of industrial applications. Our strategy and commitment are to collaborate closely with our customers to understand their needs and work quickly to bring innovative solutions that help them differentiate their products in the marketplace." Multiple staged investments and expansions are underway at Lubrizol's facilities around the world, in alignment with Lubrizol's ambitious growth strategy. Commenting on this, Gabe Rhoads, general manager for Lubrizol Engineered Polymers states, "We see a very bright outlook for growth, not just in Asia, but globally. Market trends are well aligned with our innovation and material replacement strategies and we see growing demand for high performance, customized materials and more sustainable solutions. We continue to invest in capabilities and capacity to support our customers and markets, maintaining our position as a reliable, high quality solutions provider." Lubrizol Engineered Polymers offers one of the broadest portfolios of engineered polymers available today including resins that are bio-based*, recyclable**, light stable, flame retardant, adhesive, chemically resistant, optically clear and fast cycling. Our technology crosses many industries and applications, including surface protection, power and fluid systems, sports and recreation, wearable devices, electronics and automotive. For more information, visit www.lubrizol.com/engineered-polymers or contact [email protected]. *Bio-based content as certified under ASTM D-6866. The ribbon-cutting ceremony commemorating the newest TPU expansion at Lubrizol's Songjiang plant and celebrated with the local Lubrizol team. From left to right: Jane Cai, regional business director for Lubrizol Engineered Polymers; Mike Vaughn, Lubrizol corporate vice president of operations, supply chain and HSE&S; Aimin Liu, Lubrizol Asia Pacific vice president of operations.